MP Vyapam has Conducted MP Vyapam Patwari Examination 2017 In two Shifts. Exam Was Conducted In Two Shifts. About 11-12 Lakhs Students are taking Part In this Examination. 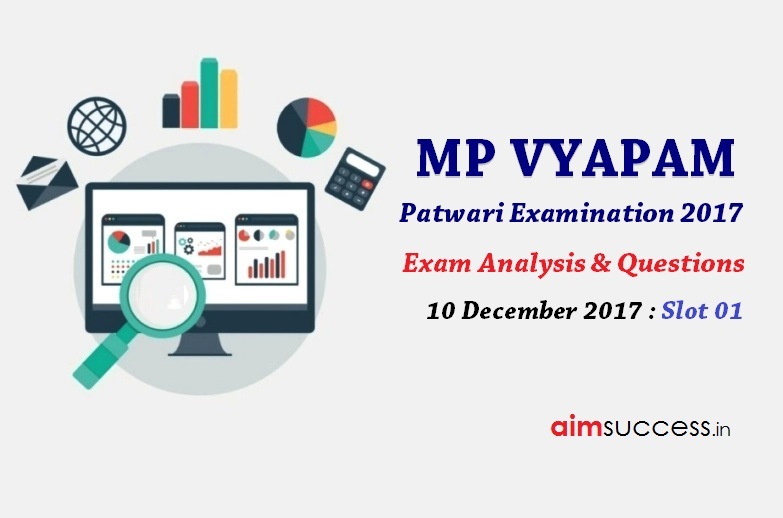 IN this Post we are sharing the MP Patwari Exam Analysis 2017 -and Expected Cut Off . बलवंत राइ समिति ने इसमें से किसकी सिफारिश की? इनमे से कौनसी परियोजना मध्यप्रदेश में नहीं है? कौनसी फसल इनमे से मध्यप्रदेश में नहीं उगती है? भारत कौनसे समूह का सदस्य नहीं है? मुरैना में 22 मंदिरों का समूह कहाँ पर है? पंचायत में तकनीकी सहायता समूह का मुख्य कार्य क्या होता है? एक प्रश्न HTML पर पूछा गया? कंप्यूटर में बेसिक कंप्यूटर, MS ऑफिस, इंटरनेट और फुल फॉर्म पर प्रश्न पूछे थे? What Balwant Rai Committee recommended from this? What is the main function of the Technical Support Group in Panchayat? Which of these projects is not in Madhya Pradesh? Which river separates the Gandhi Sagar project into two parts? – Chambal R.
Which crop does not grow in Madhya Pradesh? India is not a member of which group? Where is the group of 22 temples in Morena? One question asked on HTML? 1-1 questions Asked on basic computer, MS Office, Internet and full form in computer? Asked and asked questions on the date? Asked 1 question on number series? Asked 1 question on time and move? Asked 1-1 question on mensuration, ratio, simplification, age and average? MP GK is Coming Hard. Questions On Maths Mostly Asked Were Easy. Gk was of Medium to Hard Level. Most Questions Were Asked From MP GK. Less Questions Asked Form Science.